In yesterday’s post I mentioned saving those left overs from the To You & Yours Shaker Card Kits. 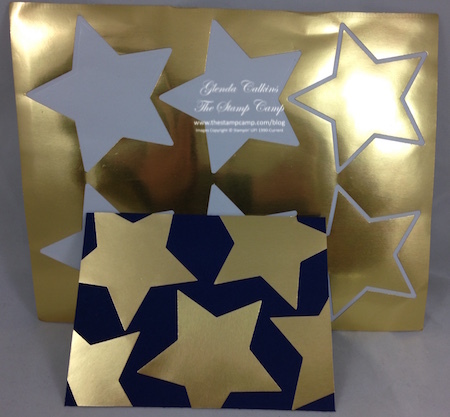 The outside die cut of these stars was used on the cards that came in the kit; so what do you do with these left over Stars? Well how about a patriot card? This is a perfect card to send to someone in the service. I had my son-in-law in my mind when I made this card. He is a Marine and is currently at Camp Lejeune in North Carolina. The To You & Yours Shaker Card Kit is in the Holiday Catalog and it is on the Retired Stamp Set list. The coordinating stamp set is also on the Holiday Catalog Retired list. 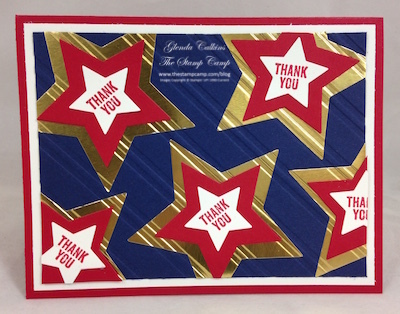 The sentiment I used on my card today is from the “For Your Country” stamp set and cut out using the Stars Collection Framelits. Stay tuned to see what I did with the left over Trees and Circles. There are 4 Gift Card Holder/Treat Holders you can make; each one a little different. Some have built in cards. These make great gifts when you want to give a little something or just make giving a Gift Card all that much more special and pretty. If your order is over $150.00 please don’t use the code. Make sure to redeem your Hostess Rewards before closing out your order.